It is quite unusual for two live recordings by the same conductor of a major symphony such as this to be released so relatively close to one another; all the more so that the edition employed on both occasions is the original 1873 version based on Wagner’s own copy and considered by many to be in some ways naïve, overlong and inferior to the 1889 Nowak version preferred by most conductors. It remained unpublished until 1977, since when its stock has risen amongst aficionados owing to notable accounts from Inbal, Nagano, Young, Blomstedt and a daringly grand and etiolated live performance from René Ballot in St Florian, which I admit to admiring greatly. 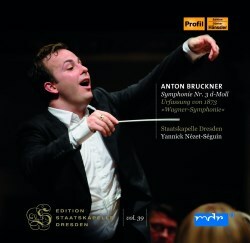 There are at least six versions of Bruckner’s “problem child” symphony and sentiment seems to be moving in favour of its earliest incarnation. In the issue of his recording on the Profil label Gerd Schaller also very successfully used, to quote my MusicWeb colleague Michael Cookson, “the previously unrecorded 1874 version edited by William Carragan; described as a variant of the 1873 version”, which is very close to the one heard here. 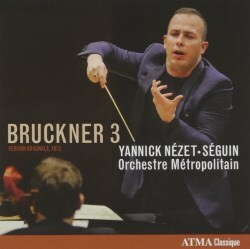 Despite the timing of their release, these performances were in fact recorded six years apart; presumably the rationale behind the appearance of the later one is that since his debut with the Staatskapelle in 2006 and his subsequent direction of the jubilee concert from which this recording originates, Nézet-Séguin’s star has continued to burn even more brightly with his appointment as Music Director of both the Rotterdam and Philadelphia orchestras, Principal Guest Conductor of the LPO and director-in-waiting from 2020 at the Metropolitan Opera, as well as guest conducting worldwide. He has been Principal Conductor of the Orchestre Métropolitain since 2000, so obviously his enhanced prestige reflects on them; consequently this recording received financial backing from the Canadian government and has duly made its appearance. Nonetheless, I cannot see a pressing need or demand for it, given that the Dresden recording was so successful and is markedly superior in several respects. Nézet-Séguin took over five minutes longer six years earlier and in truth there are times where this Montreal performance sounds simply perfunctory. It is listed as a “recorded in concert” but no specific dates are given and I can hear no audience; by contrast the Dresden concert is definitely live but with a minimum of extraneous noise and has decidedly more impact and presence both sonically and artistically. It is hardly surprising that the Staatskapelle strings sound richer and fuller, their famous aureate glow filling phrases more expressively and weightily than their Montreal counterparts. The magical opening of cascading arpeggios is so much more urgent, immediate and mysterious in Dresden and the gradations in dynamics are more subtly graded, too. However, I must single out for praise the sublime concentration here of the quiet section fifteen minutes in, with its magical descending octaves before the recapitulation of the pulsing first subject. The Adagio is well played in Montreal but again sounds distinctly cool and detached compared with the glorious involvement of the Dresden band; a sense of haste is hardly surprising considering that Nézet-Séguin shaves some three minutes off the timing of his earlier recording. The Scherzo lacks bite and energy in the articulation of the second polka theme and the finale similarly suffers from a certain listlessness, lacking the lilt it requires; the emotional temperature remains tepid throughout. Finally, the final D major trumpet chorale is considerably more stirring in Dresden. All in all, then, a somewhat disappointing second outing for Nézet-Séguin in this symphony; the earlier recording is much to be preferred.